So, it’s summertime here in California, USA. And that means there’s fruit and vegetables aplenty. This little house we moved in to a couple of years ago has a few Pluot trees – a hybrid fruit made by crossing plums and apricots – and then apparently they’ve refined that with other stone-fruit crosses. I’m not sure what varieties we’ve got here, but this year, two of the Pluot trees were full of fruit. The “Tokay Plum” flowered quite late in the spring, and not very abundantly, so I didn’t expect it to produce anything. (We had a decent winter for rains this year, but these trees have been pretty water-deprived in the previous year, so actually didn’t produce anything last summer.) The plum surprised me by actually growing a little bit of fruit, so when I harvested the first batch of pluots for jam, I also threw in a few plums. Mostly, they just added color. The jam came out a pretty kind of cranberry red color and it tasted amazing. I used a plum jam recipe I found on YouTube. She recommended adding a little cinnamon to the plums, so I put that in the pluots. Excellent suggestion. The second batch of pluot jam I made, is more of an amber color, because the plum tree was pretty much fresh out of fruit. I also added cinnamon to this batch. 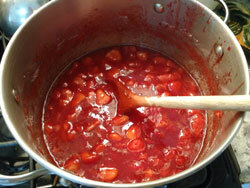 Next up – Strawberry jam. I’d been wanting to make some of this for a few years, but just hadn’t gotten around to it. I remember stirring strawberries in the hot summers when my mom was making jam, and later when my BFF and I made it over at her house. I think if I were forced to pick a favorite jam, it would probably be strawberry. I really didn’t know how much to buy though, because it seemed like we bought flats of strawberries and made jam from that. This bowl full of strawberries made about 9 pints of jam. That was plenty for one day! And two people. Of course, we will be sharing with our friends. We have more than we can eat in a year here – and I still want to make some peach jam. 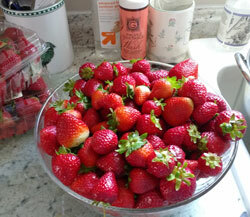 This is a giant salad bowl full of clean strawberries. Once they were de-leafed and sliced they went into the pot where they were treated to a potato-masher to smoosh them down into a manageable batch. Each batch smooshed down to about 5 cups. Then, it was all stirring and cooking. It’s amazing how much water is in strawberries. You don’t add ANY to them as they cook down they make their own syrup from the sugar and their own juice. Interestingly, recipes for strawberry jam are pretty simple – I ended up using Pioneer Woman’s found here. Some add pectin, some don’t, (I did, as well as a couple tablespoons of fresh squeezed lemon juice per batch), and sugar of course. Again – mmmmmmm good! And the smells take you back to the summers you were canning with your Mama or Bestie. My sister gifted me some rhubarb/nectarine butter last month. Wonderful stuff! It tastes especially nice atop vanilla ice cream. Another friend gave us some apricot jam made from apricots she grew on her property. I’ve got a bit of a barter going with another friend – jam for some lemon curd. 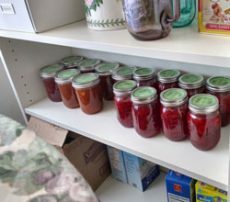 So, this year is a bit of a bonanza for preserves so far. Can’t wait to get my peach jam started.